BESIDE the fireplace in Valerie Hunter Gordon’s living room is a walk-in cupboard. Inside, it’s a cross between a museum of social history and Megan from Mad Men’s filing cabinet with ancient nappies, rubber pants, adverts for sanitary towels, letters, order books and yellowing photographs. This glory hole – in a family house 10 miles north of Inverness – was once the registered office of Paddi. It was 1948. Valerie’s third child, Nigel, had been born the year before and she was living in Camberley, Surrey. Her husband Pat, a major in the Royal Engineers, was back from Borneo and teaching at the Army Staff College. 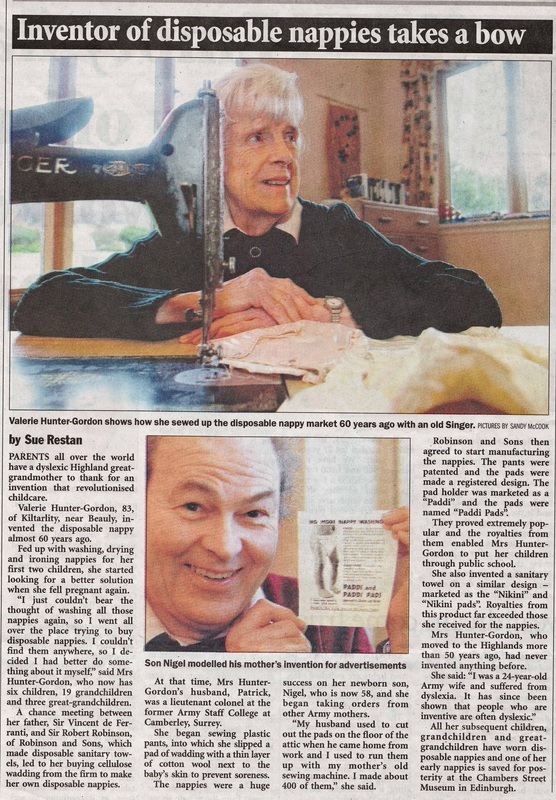 Casting around for an alternative to the drudgery of the mangle and the washing line, she alighted on the nylon material used for parachutes and made a pair of prototype nappy pants on a Singer sewing machine. The lettering from the parachute was visible on these early versions, which were lined with cotton wool. However, they were not an immediate success. Using Nigel as a model, the granddaughter of engineer and inventor Sebastian de Ferranti – the man known as “Britain’s Edison” – kept tweaking her nappy plan and soon, her friends, all army mums, wanted a pair. Valerie ended up making more than 500 pairs of pants in her kitchen and selling them for 5/- each. A new material, PVC, allowed her to make a robust, waterproof product and eventually she got something that worked – adjustable waterproof pants fastened with poppers, with a cord around the waist. They could be wiped clean, or washed and bleached. No ironing required. After some trial and error, the pads were made of cellulose wadding with a layer of cotton wool on top. Given that every woman in Surrey was looking for her nappies, Valerie and Pat thought there must be some commercial mileage in them. They approached manufacturers and retailers but none were interested in a product that could save women hours of manual labour. The breakthrough came at a Royal Society dinner. Valerie’s father, then a director of Ferranti, was sitting beside Sir Robert Robinson. His company, Robinson of Chesterfield, made sanitary towels. When he confessed this to Ferranti, he immediately gave his daughter’s nappies the hard sell. It worked and Valerie had found her manufacturer. “Lord Robinson was a friend of my father. Valerie’s product was patented. 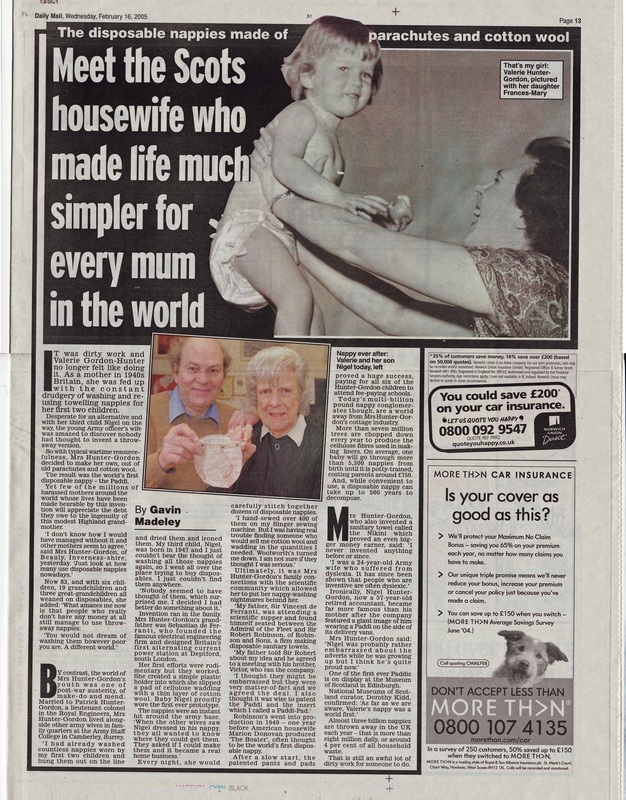 She signed an agreement with Robinson in 1949 but it needed a catchy name and generations of babies nearly wore Snappy, Lavnets, Drytot, Easynap, Beautykin, Padinap, Padlet, Padikin, Quicky and Lifesaver. It was Pat, with the help of army colleagues, who came up with Paddi. They weren’t an overnight success. In the post-war years of make do and mend, a product designed to be thrown away seemed extravagant and doctors were concerned that the nappy would be a permanent poultice on a baby’s skin. A complimentary article in the Lancet went a long way to allay the medical establishment’s worries. Boots began stocking Paddi and the product was featured in the Ideal Home Exhibition in 1952. 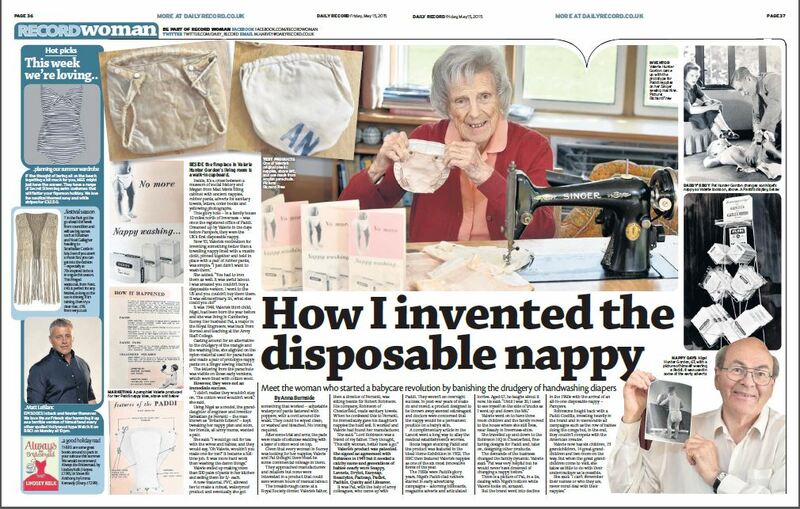 The BBC then featured Valerie’s nappies as one of the six most innovative items of the year. The 1950s were Paddi’s glory years. Nigel’s Paddi-clad nethers starred in early advertising campaigns – adorning billboards, magazine adverts and articulated Lorries. Aged 67, he laughs about it now. Valerie went on to have three more children and the family moved to the house where she still lives, near Beauly in Inverness-shire. She travelled up and down to the Robinson HQ in Chesterfield, fine tuning designs for Paddi and, later on, designing other products. The demands of the business changed the family dynamic. There is a picture of Pat, in a tie, dealing with Nigel’s bottom while Valerie looks on, amazed. But the brand went into decline in the 1960s with the arrival of an all-in-one disposable nappy – Pampers. Robinsons fought back with a Paddi Cosifits, investing heavily in the brand and in memorable ad campaigns such as the row of babies doing the conga but, in the end, they couldn’t compete with the American invader. Valerie now has six children, 19 grandchildren, 14 great grandchildren and two more on the way. But when the great grandchildren come to visit, she takes as little to do with their undercrackers as is possible.